As someone who grew up in the 90s, I occasionally get super nostalgic for the terrible unisex fashion of my early childhood. 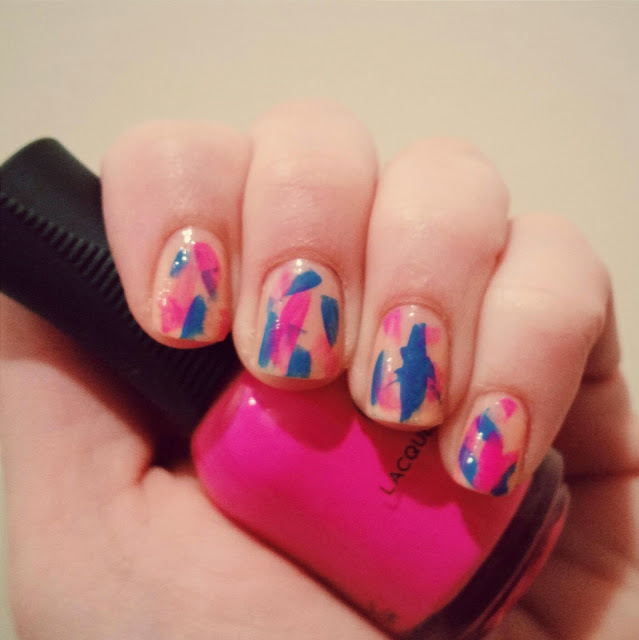 Loosely inspired by all those insane tracksuits that populated our lives at that time, for this I used a base of Revlon Colorstay 025 Seashell with random brushstrokes of Orly Neon Heat and Julep Linden. I'm really quite pleased with it, though the Orly is showing up way more magenta and less neon in this picture than it looks in real life. I've been finding that I like to use Julep polishes as accent colors more often than a full nail color, which is somewhat puzzling. I'm considering canceling my Maven subscription just because I haven't been particularly inspired by the color choices the past few months. Are any of you Mavens? What do you think? If you're not and you'd like to become one, feel free to use my referral link.